Apart from the flagship project, community development is envisaged in which women and children will participate in creative projects involving books, creative writing and bookmaking. The project will benefit the community by means of the following projects, undertaken in collaboration with the Centre for Creativity and the ATKV School for Creative Writing (both already established at the NWU with community projects and links). 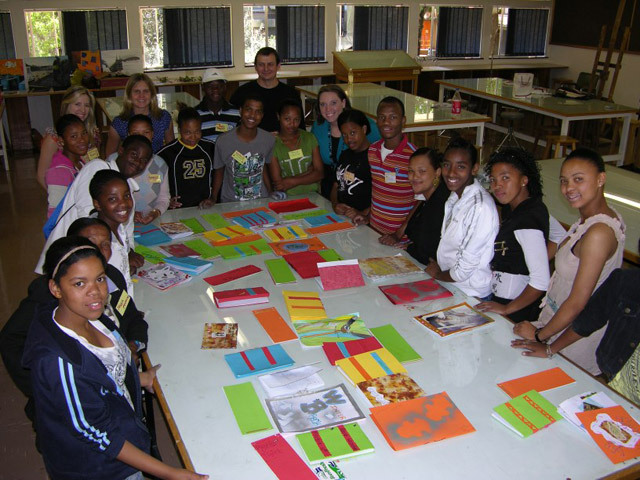 Two core projects are the Tambani community project (Venda) and Creative writing and bookmaking workshop in the local community: Karos & Kambro. The flagship project (the exhibition) is in itself a form of community outreach in the sense that schoolgroups will be given guided tours and artists’ talks. 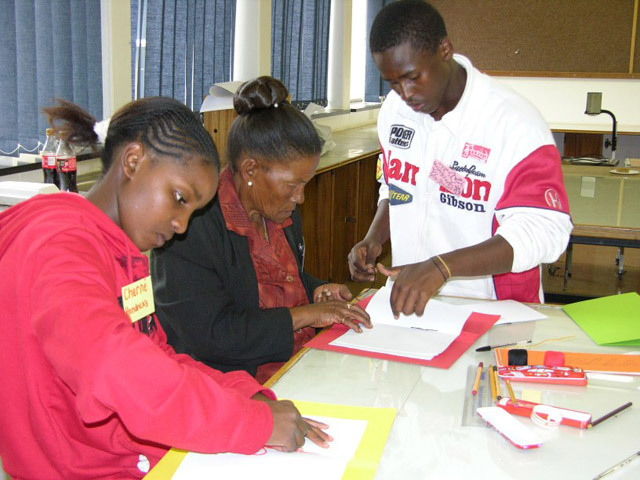 The Tambani Community Project (www.tambani.co.za) is based in the towns of Fholovhodwe and Muswodi-Tshisimani, which are in close proximity of each other. These towns are situated in the Limpopo Valley, approximately 50 km south-east from Musina, and approximately 750 km north-east from Potchefstroom. The founder and head director of the project is Dr. Ina le Roux of Johannesburg. She is a retired lecturer of Afrikaans and Dutch whose Ph.D in religious science dealt with the worldview presented in the song-stories (ngano) of Venda women. The dire financial and social plight of these rural women’s realities captivated Ina and motivated her to launch an embroidery project that currently helps to support about 65 women and their families. Ina makes sketches on fabric of scences from the stories that she has recorded and the members of the project then embroider these scenes. The pieces of fabric are applied to items such as handbags and wall hangings, and marketed together with the specific stories. Money generated from selling the articles is used to further fund the project. Karos & Kambro www.karosandkambro.co.za is a Non-Profit Youth Development Organisation operating on a national level in South Africa. The performing arts, nature, fun and adventure form part of this integrated skills development programme. The programme provides a behaviour change vehicle and helps to stimulate a process of healing and a transformation in the lives of vulnerable youths. A local branch of Karos & Kambro in Promosa is involved in this project. The Promosa branch participated in the Creative Creatures project as well as in various previous projects of the ATKV School for Creative Writing and the Subject Group Creative Writing. 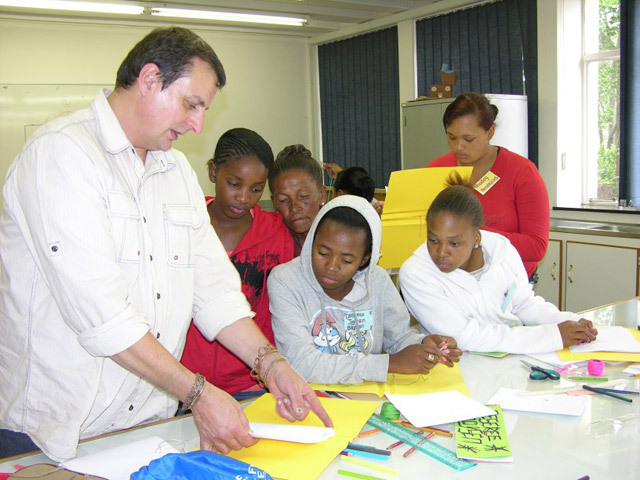 This particular project entailed a workshop on creative writing and bookmaking by Flip Hattingh, Franci Greyling and Anneretha Combrink (September 2009). The participants made their own books and wrote stories. The workshop mainly served as a vehicle for stimulating creativity and to develop skills, and also as a medium for self-expression. Outcomes of the project: Diverse outcomes links with the objectives of Karos & Kambro as an organisation and also entails developing creative skills, promoting a culture of books, reading and writing, self-discovery and the cultivation of a community identity. 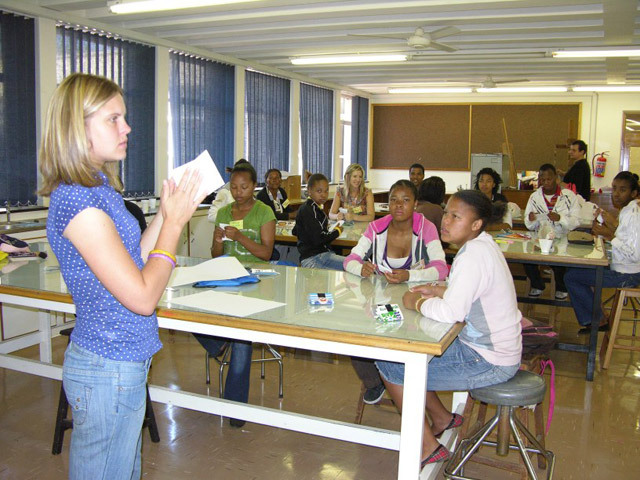 The outcomes of the sub-project also contribute towards research on community-based folk writing undertaken by the Subject Group Creative Writing.